​Keyboard & Chorus. Born on June 30th, 1985 in Hyogo Prefecture. Blood-type B. ​Vocal & Guitar. Born on August 22nd, 1985 in Kanagawa Prefecture. Blood-type A. 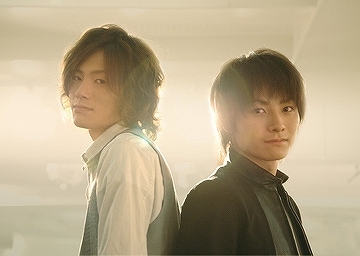 In November 2007, the band was formed when singer-songwriter Miyata and support musician Iwaisako met. Began doing street performances in Kawasaki and Shibuya Yoyogi Park. In December 2008, in parallel to establishing their style of covering foreign songs in Japanese, released their 1st indie single “Amaoto wa Chopin no Shirabe”. The number of audience at their street performances done every weekend grew to become 100 to 200 every time. Sold more than 2000 CDs by hand within half a year. On December 16th, 2009, debuted with the EP “Radio Science” from Victor Entertainment. Has performed at many free events at shopping malls, resulting in a solid fan-base comprised mainly of women from all age groups.